There’s something about the smell of lemons that makes me happy. I absolutely love to zest or juice lemons because even after washing my hands, that lovely lemon smell remains. I’m really curious as to why the don’t sell lemon scented candles. Or at least any that I’ve found. I’m sure I’m not the only person in the world who loves that lemony smell. For January’s Improv Challenge our ingredients were lemons and sour cream. Ironically, as much as I love to cook and bake, my favorite part of the Improv Challenge is finding a recipe. There are about 60 of us that participate and there aren’t any guidelines on where we can search, so its pretty likely that there will be repeat recipes. But I take the word Challenge very seriously. Instead of just picking one the first results that come up after searching “lemon and sour cream recipe” I break the challenge into two parts. One is finding a recipe that I don’t expect anyone else to make. The second part is to (obviously) successfully make the recipe. While I realize its January and most people are still trying to eat healthy, I couldn’t pass up an opportunity to make donuts. I’ve never made donuts before and I’ve been debating on purchasing a donut pan from Amazon with my gift cards so I can bake donuts. Because really, if you can shave some calories off something as delicious as a donut by baking it instead of frying it, you’d do it too, right? 1. In a medium bowl, whisk together the zest and juice of the lemon, sour cream, sugar, eggs and olive oil until smooth. 2. In another medium sized bowl, combine the flours, baking powder and salt. Add the dry ingredients to the wet ingredients and stir until smooth with a spatula. 3. Cover the bowl with plastic wrap and refrigerate for at least one hour. 4. Place a wire cooling rack on top of a baking sheet. Top the rack with a layer of paper towels. 5. Bring the oil to 325 in a Dutch oven. Scoop 1/4 cup fulls of the batter into the oil. Cook in batches of 4-5 for 5-6 minutes each or until lightly golden. 6. Transfer the donuts to the paper towel lined cooling rack and repeat with remaining batter. 7. In a small bowl, combine the powdered sugar, milk, lemon juice and zest together until a glaze forms. Make adjustments to each ingredient until you reach the desired consistency. 8. 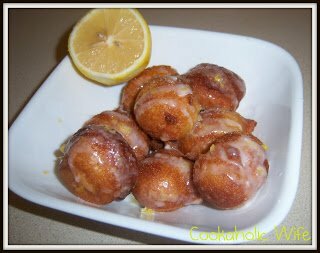 Once donuts have cooled slightly, drizzle glaze over donuts and serve immediately. These were pretty tasty, but I felt like the lemon flavor should have come through more. I’m not sure if its the type of oil I used or what, but I wouldn’t mind messing with the recipe a bit to make some adjustments.